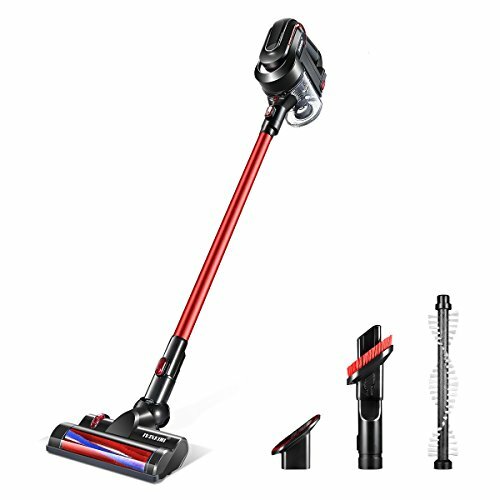 This 3-in-1 Cordless Stick Vacuum Cleaner Rechargeable Handheld Bagless Vacuum Carpet Floor Dust Collector will be your optimal solution. - Multi-Cyclonic HEPA Filter: Capture allergens and expel cleaner air than the air you breathe, avoiding the second pollution as suction the dirt evenly. - Vacuum Cleaner Tool Set: Accessories with Electric floor brush, Hard Bristle Roller, metal tube, small static brush, crevice nozzle, furniture brush and wall-mount bracket. - Electric Floor Brush: Perfect for clean the dirt and dust from your hard floor and carpet such as ceramic tile, hardwood flooring, laminate flooring, marble flooring, cork flooring. - Hard Bristle Roller: Remove the dirt, debris, and hair including pet hairs hiding in your carpet with powerful suction from the carpet, auto interiors and more. - Small Static Brush: Brush away hair and dust from the surface of desks, chairs, curtains and more. - Crevice Nozzle: Take away the dirt and debris from the hooks and crannies from your keyboards, bookcases, couches, furniture, ceilings, and cars. - Furniture Brush: Clean the dust on your furniture, such as bookcase, closet, cupboard, cabinet and more without leaving any trace. - LED Battery Screen Display: Show how much battery is left. - Charging Time: 3 Hours approx. - Working Time: 30 Minutes approx.